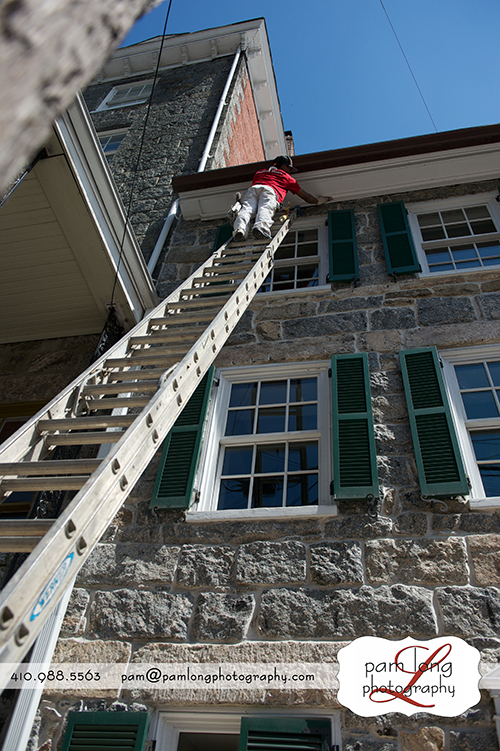 We welcomed in Spring with a BANG in Historic Ellicott City last month! 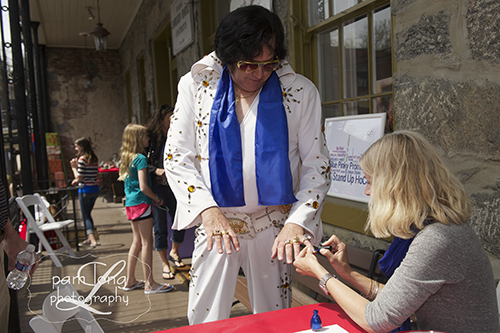 Ellicott City held it’s annual Spring Festival which included several bands, artisans, vendors, craft beer gardens, children’s activities, yummy treats, and specials at the local shops, restaurants, salons and boutiques. The weather was just perfect – we had both sunshine and a breeze! It was such a glorious day! 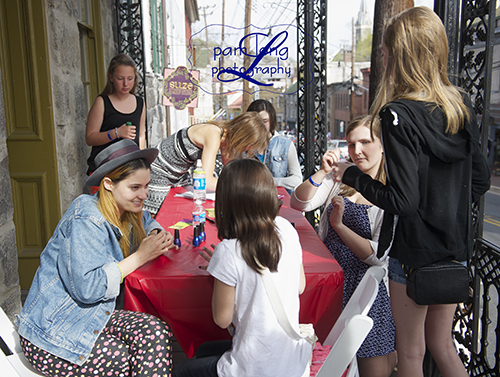 Main Street was jam-packed with people of all ages enjoying themselves! 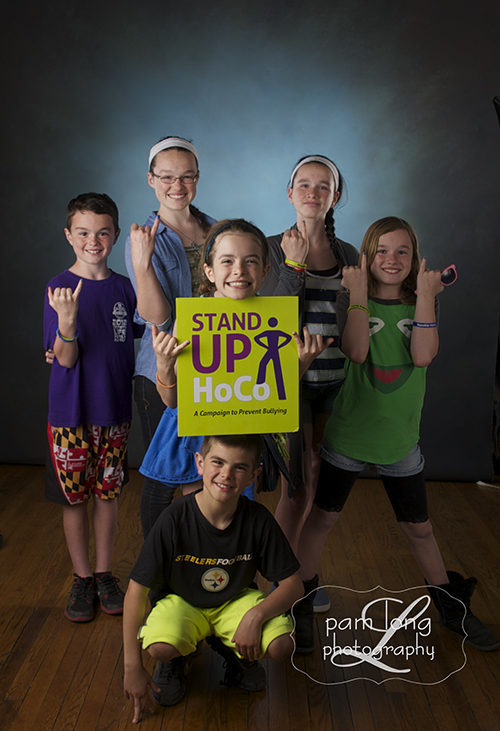 Here at Pam Long Photography, we championed HoCo’s Stand Up – Blue Pinky Project, which is Howard County’s anti-bullying campaign. 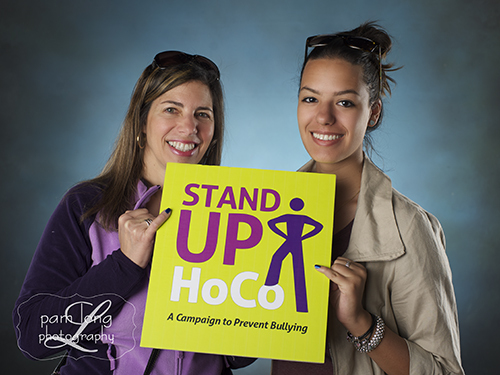 Keri, the Director of the County’s Office of Children’s Services (the office which oversees the county’s Stand Up HoCo campaign) and her daughter, Josie, came to our studio for several hours on Saturday to help us raise awareness about bullying. 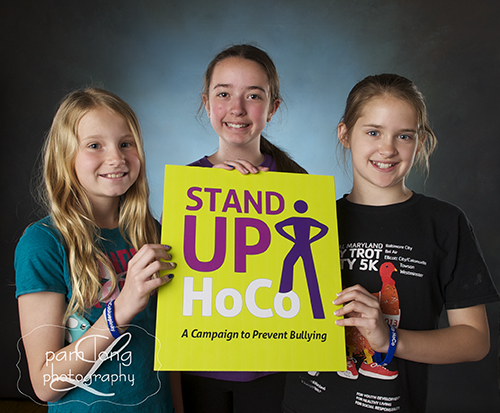 Keri provided literature that gave information about bullying and ways to prevent bullying, she brought anti-bullying bracelets that were given out, book marks, and lots of blue fingernail polish!! 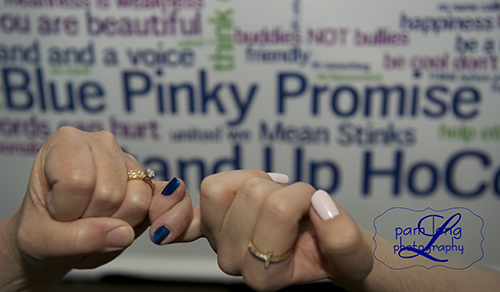 We were able to paint over a hundred pinky fingernails blue, showing our stand against bullying. 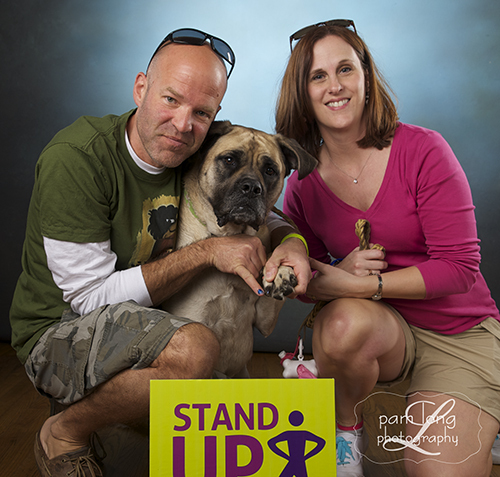 We even had some men who agreed to have their pinky nails painted and a few of our canine friends participated, as well. Check out all of the cute photos below! A huge thank you to everyone that help prepare for this day, for those that initiated this campaign, for those that continue the push to spread the word, and for everyone that came out during Springfest and pledged against bullying! 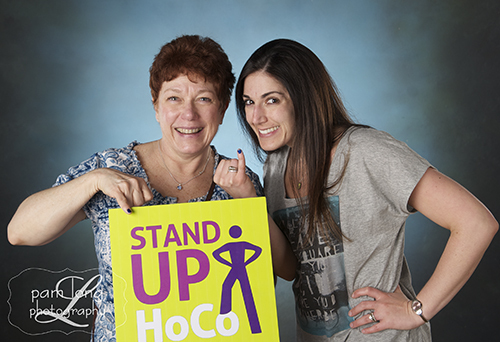 I appreciate Jaki Ulman’s enormous efforts in partnering with StandUp HoCo to start Blue Pinky Project here in Howard County, MD. We are so very proud and thankful of all the efforts made! Participants had the choice to enter our free raffle. Later that day we picked five lucky winners!!! The winners and their prizes were: Christa Lee won a $90 intensive therapy conditioning treatment, cut and style from Salon Marielle! 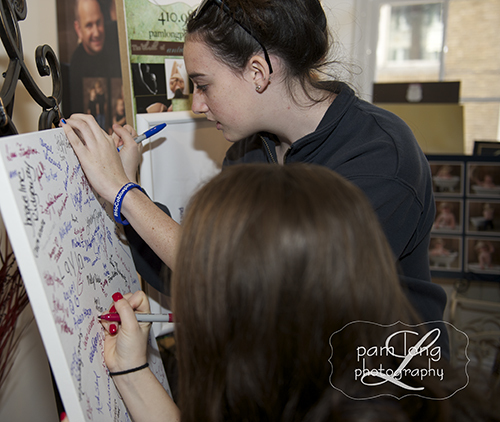 Marianthy Mendez and Nala Jackson both won $100 toward a future session at Pam Long Photography! 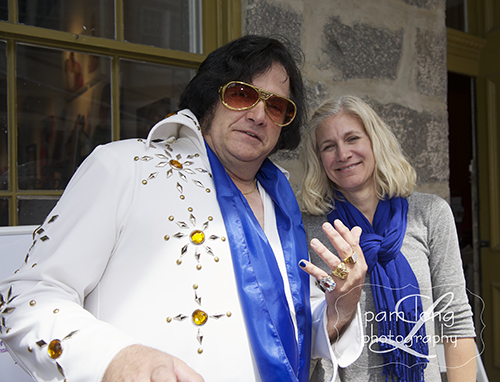 Sandra Barton won a $25 gift certificate for a manicure to Ooh la Lal. Christa Wheeler won a gift basket loaded with bath and body products and jewelry from A Journey from Junk! Congratulations to all our winners and thank you Salon Marielle, Ooh la Lal, and A Journey from Junk for your donations towards the cause!! We appreciate your partnership. There are some incredible events coming up in our area and I wanted to share them with you! First, there is an incredible fund raising opportunity for all you philanthropists out there! The 3rd Annual Power of the Purse Event! The event is scheduled for June 10, from 4:30p to 7:30p and will be held at Fretz, which is located at 9204 Berger Road, Columbia. The Power of the Purse is an incredible fundraiser that accepts gently used designer and vintage purses and then auctions them. These donated purses will be available for cash and carry. New and designer handbags, some of which will be filled with goodies (gift cards, etc), will be included in our Silent Auction. In addition, Iron Bridge Wine Company will provide wine tasting and a cooking demonstration by Chef Lewis. Awesome! There will be light fare provided, networking, and much more. The beneficiaries of this year’s event are Blossoms of Hope in support of the Claudia Mayer/Tina Broccolino Cancer Resource Center at Howard County General Hospital and Business Women’s Network of Howard County Scholarship Foundation, Inc.
Be sure to mark your calendars, we would love to see you there! Tell all your friends and join us for a fun evening! Thursday, June 12th at 7:00pm, come out and enjoy food from Clyde’s, wine from Iron Bridge Wine Co, Desserts by Elkridge Furnace Inn and Georgetown Cupcakes. LIVE & Silent Auctions, as well as a friendly hitting and pitching competition. The Gala is taking place at the Factory Athletics Headquarters located at 9212 Berger Rd., Columbia, Md. This annual event is held to help raise money to benefit the Factory Foundations’s initiatives. The Factory Foundation’s goal is to promote baseball and softball, education and quality of life for children across America. Their aim is to give underprivileged children an opportunity to enhance their experiences by being able to attend player development camps, national tournaments, showcases and college recruiting programs. 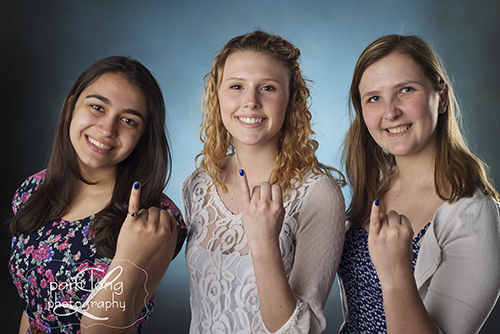 They also provide college scholarships to select candidates, based on need. For Tickets and additional information, please visit: www.factoryfoundation.org/gala. This awesome event will take place on June 12, 2014 from 4-7 pm. 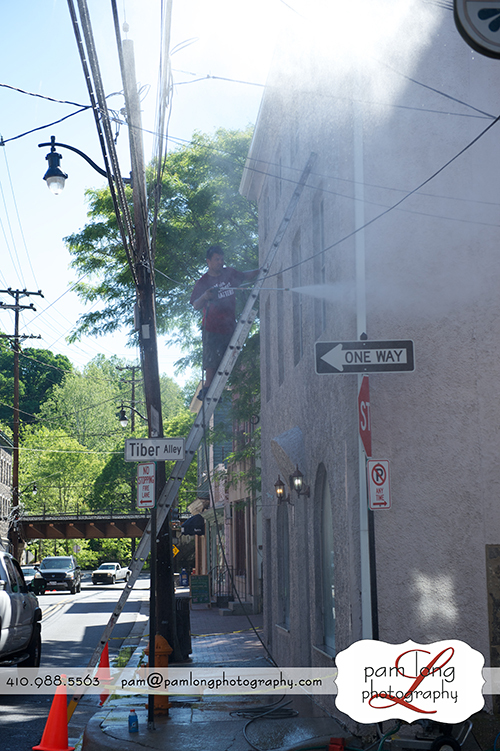 Benjamin Moore selected our Ellicott City’s Main Street (and 19 other communities) to give a face lift! Yea! 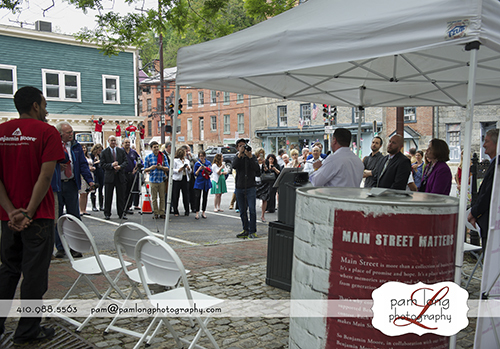 Benjamin Moore created Main Street Matters to help revitalize historic areas and support the independent businesses located therein. Main Street Matters is an extension of their belief in the power of community, their support for small businesses, and their desire to help build a durable, sustainable future. Awesome! A very fun celebration of our town and Paint What Matters will be taking place this Thursday, June 12, 2014 from 4-7 pm. There will be fun, balloon decorations and a 3-D cake….a replica of our Main Street! I can’t wait to see that! 🙂 This event will be located at the bottom of Main Street, in front of the B&O Museum, located at the corners of Main Street and Maryland Avenue. 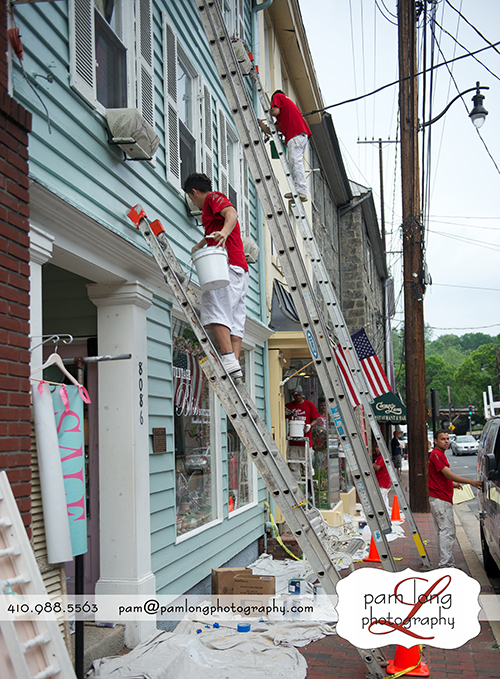 Come see all the painting progress and celebrate our beautiful town with us! See you there! 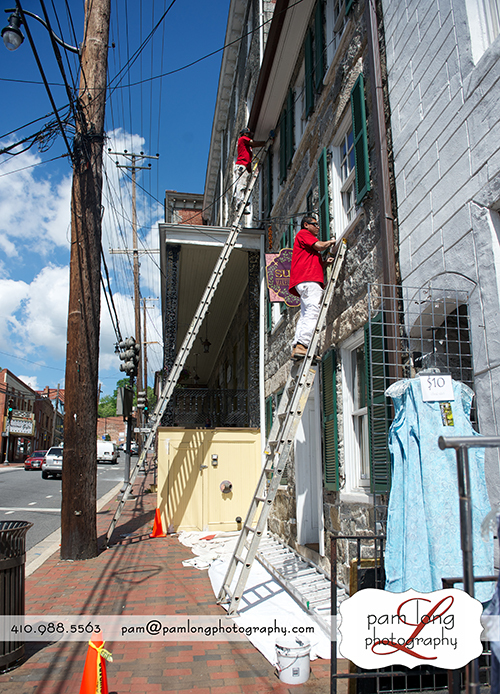 Get a free souvenir Ellicott City photo taken in our special Main Street Matters photobooth, join in the Scavenger Hunt to match paint colors to the freshly painted buildings and win a free t-shirt! 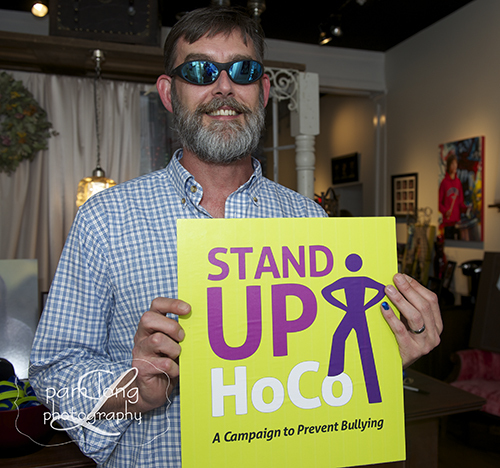 Be sure to check out the Event Link for more info by clicking here. 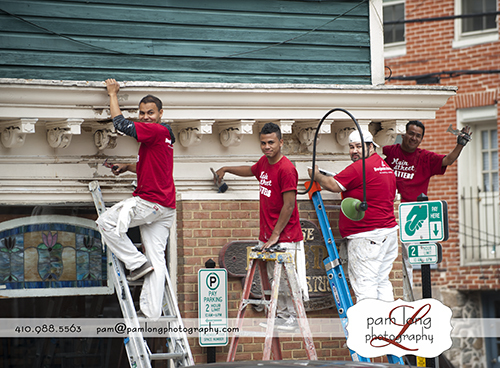 Here’s a link to an earlier blogpost from when they started the painting on Main Street. They are expected to be finished painting toward the end of the month! Click here for the blogpost! 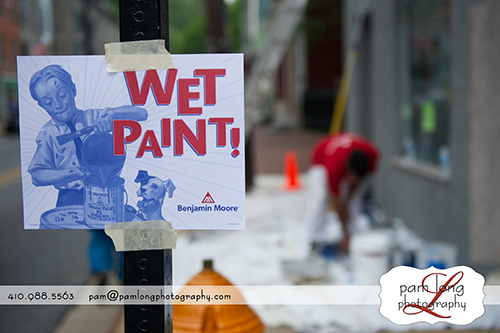 May 21st, Benjamin Moore sponsored a kick-off event…. These next few images show the guys preparing the buildings, days before the actual painting started. I’m so impressed with their attention to detail. 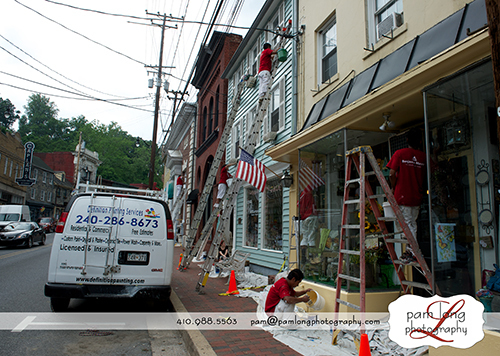 Joel, and his crew from Definition Painting Services, have rocked this town! We appreciate their hard work. Thank you for taking the time to read this blogpost! I hope to see you at one or all of these events!